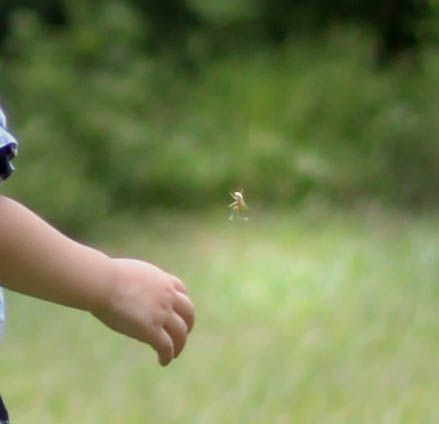 Recently I was editing one of my photo sessions and I noticed something next to the little boy's hand. I zoomed in and saw this. LOOK! It's a grasshopper in mid air! It's not very clear because the focus was on the boy and I cropped him out. Look at those little feet! If I actually tried to capture a grasshopper in mid-flight it would never happen. But this photo just cracks me up. What's making you giggle lately? Is it just me, or does it look like the grasshopper is trying to hail a cab? Okay, yeah. It's probably just me. That's the coolest thing ever! It's like he's walking through the air swinging his arms! You should get an award for something like that! He looks animated! So sweet! Wow. It looks to me like he's running toward (towards? Which do you say?) the boy's hand. Too funny! My husband has been making me laugh lately. He can be silly. How cool is that. That is a 1/million shot for sure. Are you sure that it isn't Tinkerbell?